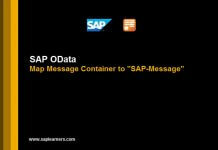 Hello everyone, in this SAP Netweaver Gateway tutorial, we will learn how to read/get images through SAP Netweaver Gateway from backend system using OData service. 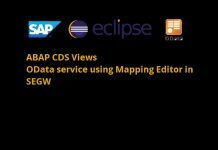 These images can be of employee photo or product images etc..
Before proceeding further we assume you know how to build OData service, if not please check out our step-by-step tutorials here,which will give you good understanding of SAP OData service. So lets get started. 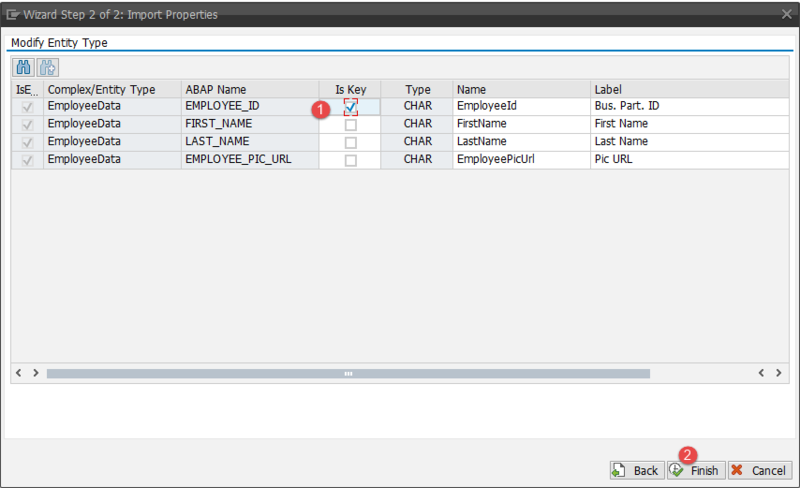 In SAPUI5 application, you want to display employee image (or) display product image. 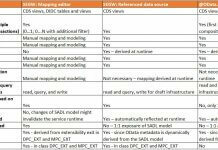 In this example i am using Enterprise Procurement Model(EPM) model data to demonstrate the scenario. We are going to display the photo of employee from the backend system. 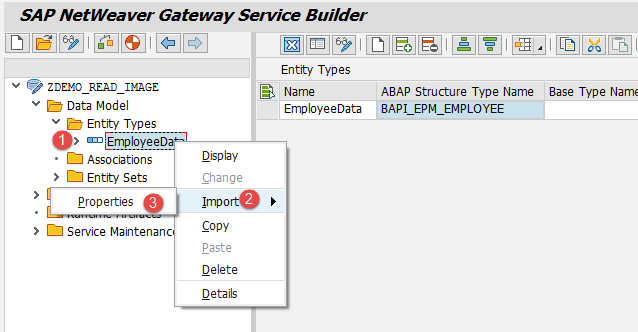 BAPI BAPI_EPM_EMPLOYEE_GET_LIST is used to get the employee data. 1. 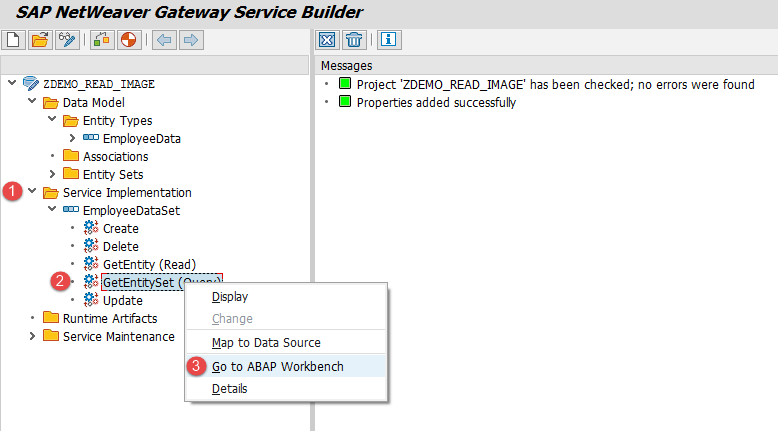 Go to Gateway Service Builder, transaction code SEGW. Create a new project by clicking on the create button in the application toolbar, provide the project details and hit OK button. 2. 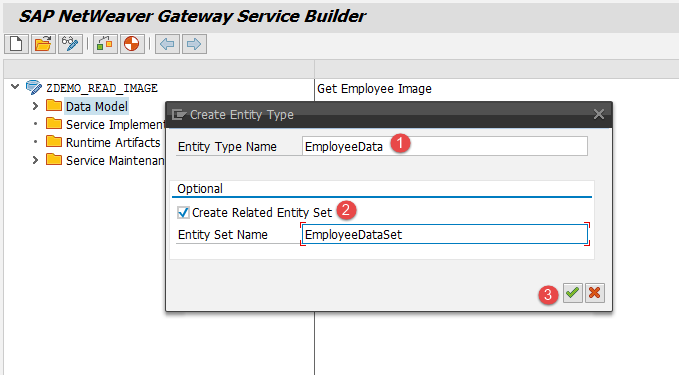 Expand the project, Right click on the Data Model → Create → Entity Type to create an entity type in the OData service. 3. In the Create Entity Type popup window, enter the Entity Type Name and select the check box Create Related Entity Set to create a default entity set. Hit OK button to create entity type and entity set. 4. In the Entity Type detail screen, enter the ABAP structure type name as ZDEMO_S_IMAGE and select the check box under Media column. Mandatory Note : A normal entity type will act as media entity type when you flag it is media by selecting the check box. 5. Save the service till now.Now add the properties to the entity type.To do so right click on entity type → Import → Properties. 6. In the Import Properties window, select EMPLOYEE_ID, FIRST_NAME, LAST_NAME and EMPLOYEE_PIC_URL and PICMIMETYPE fields and click on Next button. 7. In the next window, select EMPLOYEE_ID as key and click Finish.Save and click on generate button to generate DPC and MPC classes. 8. Setting Entity Type as Media in the step-4 is not sufficient we also need to set manually via coding.To do so, go to the MPC extension class and redefine the method DEFINE and write the below code inside it. 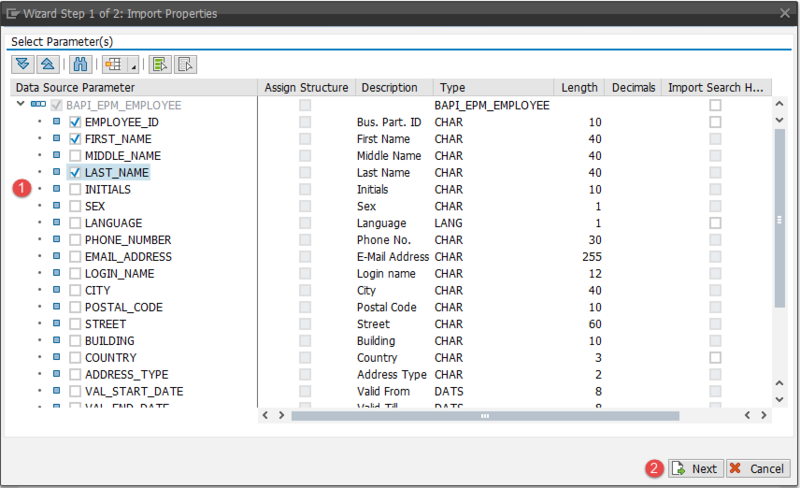 lo_property    TYPE REF TO /iwbep/if_mgw_odata_property. 9. Now we need to implement the method EMPLOYEEDATASET_GET_ENTITYSET in DPC extension class.Expand the Service Implementation node and right click on GetEntitySet(Query) → Go to Workbench to implement the method. 10.Write the below code in EMPLOYEEDATASET_GET_ENTITYSET to get the list of employees using BAPI with employee’s picture URL and mime type. lo_mr_api        TYPE REF TO if_mr_api. LOOP AT lt_employee_data INTO ls_employee_data. IF ls_entityset-employee_pic_url IS NOT INITIAL. 11. As of now we are ready to test the service.Save and generate the service and make sure that DPC and MPC extension classes are active. Go to transaction SAP Netweaver Gateway Client – /IWFND/GW_CLIENT to test the service.You should see the output like below. 12. We have successfully got the image URL in the output, but to get the raw data of the image we need to implement method GET_STREAM so that we can use $value in the output URI to get the raw data.Redefine the method in DPC extension class and write the below code. READ TABLE it_key_tab INTO ls_key_tab WITH KEY name = 'EmployeeId'. IF ls_emp_data-employee_pic_url IS NOT INITIAL. CHANGING cr_data  = er_stream ). 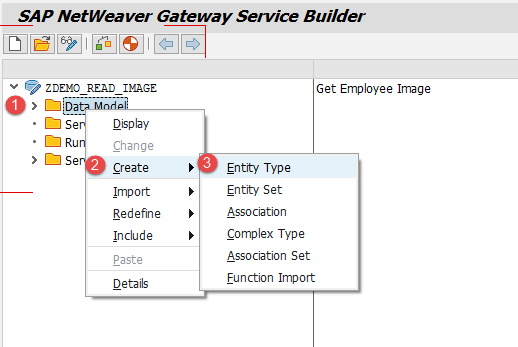 You have successfully created and implemented service by which you get employee image through SAP Netweaver Gateway. 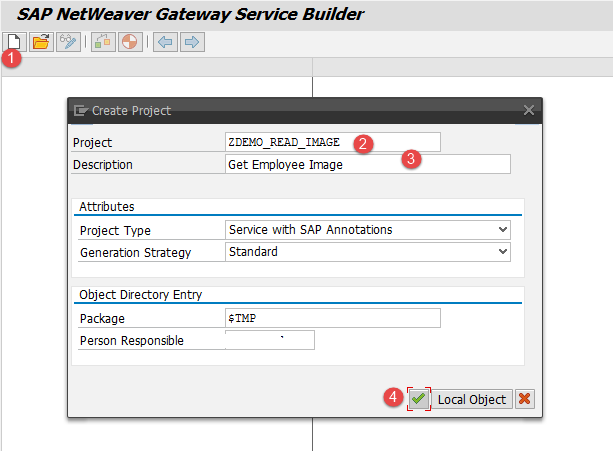 Stay tuned to us for more SAP Netweaver Gateway tutorials. Please feel free to comment and let us know your feedback.